Yesterday was quite far from the perfect one, at least until around 7:20pm Dubai time. But later about this. In Dubai it’s getting hotter, the summer is coming and you cannot deny it. It’s not just about the temperature, but the humidity lately is going up and this affects everyone’s well being. I was working on async tasks and loaders in my Quake Report app that I’m doing as a part of Udacity Nanodegree. I had to grasp a lot of new concepts, bunch of code here and there, working together. The focus is not only on copying and pasting but actually understanding why the code is written like this and why do we need it in exactly that shape. The AC got crazy either blowing at max level so you could freeze to death or not working at all so you’re sweating a lot…So my body was tired of humidity, and additionally I have been beating my brains out trying to understand all the new code I needed in my app. WOOHOOO! I got it! All the work paid off! I got into the program where I receive personalised feedback on each of my projects, and also receive a Udacity Nanodegree credential upon successful completion! It means individual code reviews that I am the most happy about! It really saved the day and made me want even more to dig into details the code I was working on! It all started in 2016 in fact. I was having off from my regular work as a project manager. I took extended maternity leave and it made me think about life in general, including my job. Just to give you a bit of an overview: my professional background is Internet. I worked several years as a Digital Project Manager. Recently I had a pleasure of spending few years in Dubai and working in an interactive agency. I worked for high-end brands, to name just a few: Mercedes-Benz, Yas Marina Circuit, Dubai Golf, Image Nation. I am proud of the work I’ve done together with lots of amazing people! All of this was great, but I always wanted to dig into details of programming. It was never the right moment to dedicate entirely to this, so I was taking some evening courses about computer science and getting a bit of experience in front-end technologies. Then while being at home with my little one I saw Google with Udacity announced a round of scholarships. I already knew Udacity, and was convinced about its high education standards, so without hesitation I applied. It was January 5th 2017, and I stuck in the polish post office trying to ship back the Amazon Kindle I got myself for Christmas. Again, I was not pleased spending there over 40 minuets instead of 5, as they could not find the proper way to register the parcel into the system (finally some IT guy found a workaround;) While I was waiting I checked my emails, again this saved the day, at least this situation — I got into the Android beginners path which kicked off in January 2017! Out of 70,000 applicants they’ve chosen 10,000. WOW! That’s a lot of people I thought. It made me really happy and excited. Another challenge accepted! I had a perspective of 3 months learning to do Android apps and then another checkpoint, as from 10,000 people participating in the programme, 1,000 will be chosen to continue for another 3 months. Learning programming is very hard. No wonder a lot of people quit. There are a lot of situations you doubt in your abilities to grasp all the knowledge. You happen to be lost, overwhelmed, tired. You need to prepare yourself for this and if you want to succeed, you need to take measures to overcome the difficult situations. Here is a good article that describes the exact path me and many people are going through. But to be absolute serious, you feel yourself as a part of community. And it helps a lot. I think having such an environment around you is one of the most important things on your education road. Of course I also spent countless hours browsing Stackoverflow and found great solutions to my problems there. But having a dedicated group of people working towards the same goal, on the same material and projects means a world! It changed a lot. Not only I acquired new knowledge and already built some apps which can be proven on my GitHub account. I also started this blog where I’m describing my coding challenges. I participate in Daj Się Poznać 2017! / Get Noticed competition. Soon I’m launching Dubai Tour Guide app that will be available to download in Google Play store. I started to read more about machine learning and thanks to programming experience I can understand more and more concepts. I am also more flexible with other technologies than Java and Android and was able to build a really cool landing page for one of my app. I think programming knowledge in general broadens your mind and especially in today’s techie world, you are able to understand more of it. That is why I am very happy I paved my way through to get additional 3-months of this amazing experience! 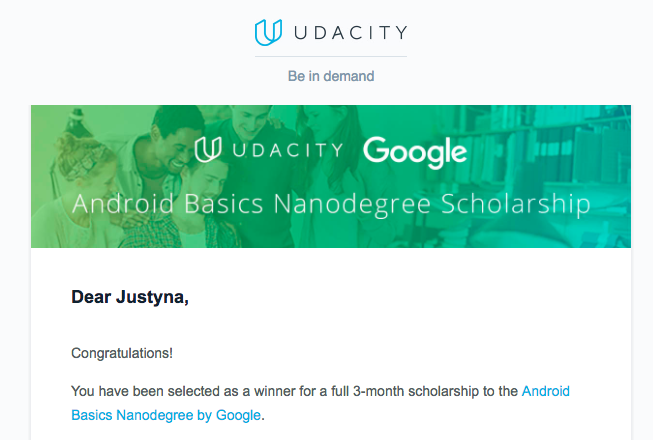 Again, thank you Udacity and thank you Google!